Philip Securities, a stock trading company that is a member of the Indonesia Stock Exchange, will hold a re-socialization of Indonesian Retail Bonds (ORI) to Batam community. Dissemination plans will be held on July 24, 2010 in the office of Philip Securities, Batam. 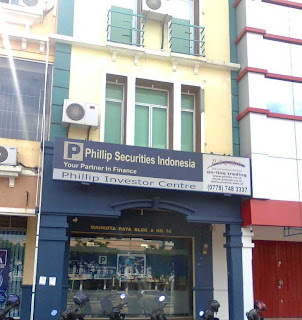 Johan Efendi as the Branch Manager of Philip Securities said, socialization ORI will later be held to solicit the public who wish to keep their assets at Philip Securities as an official institution designated by the Indonesian Stock Exchange as a dealer ORI. "ORI or the Indonesian Retail Bonds are bonds issued by governments and are sold in retail / retail, because it is called Bonds (Bonds) Retail Indonesia. Minimum purchase Rp. 5 Million USD and addition of multiples. 1 Million, and now we are elected as a dealer ORI offered to the public through the scheme to buy "said Johan Efendi. Generally, bonds can be interpreted as containing a statement of Securities owed certain amount of money within a certain timeframe of the party that issued the bonds to parties who purchase the bonds. "On debt, the issuer of bonds in this case the government or the State 'promise' to pay debt interest periodically until the end of the period or maturity of the bonds. Bonds are more familiar with the term fixed interest coupon nature and magnitude has been determined at the beginning '"adds Johan. In order to attract investors or the owners of the fund, the interest coupon bonds when issued generally offer higher interest than savings accounts and time deposits prevailing at that time. In addition, bonds can also be traded prior to maturity. So when you buy a bond, then you enjoy the benefits derived from coupon payments of interest and also the difference between buying and selling prices in the middle of the road when you decide to sell the bonds you hold. "And of course you can get ORI at Philip Securities, with a limited supply schemes, we will conduct socialization to you regarding the introduction of what ORI and the benefits and advantages, as the record ORI is a zero risk investment asset, meaning that no risk at all in its implementation, "concluded Johan.